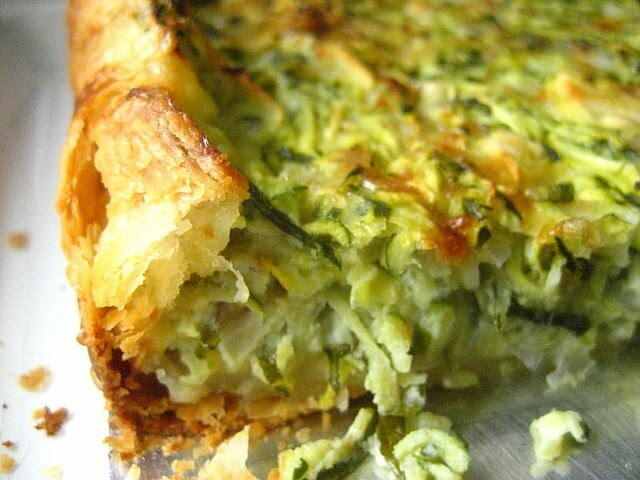 I love Spanokopita, a traditional Greek spinach pie made with phyllo dough, spinach, onions, dill and feta cheese. But I am too lazy to layer sheets of phyllo in wet towels and brushing them with butter so they don't dry out. Zucchini were on sale for .79 lb and I couldn't resist buying a bunch. I figure I would make some zucchini recipes this week. Kolokithopita is similar to Greek spinach pie, only it uses zucchini (courgettes for you Aussies and Brits) instead of the spinach. When your zucchini is falling off the vine at the end of the summer, think about making this instead of a greasy zucchini bread! It was delicious! 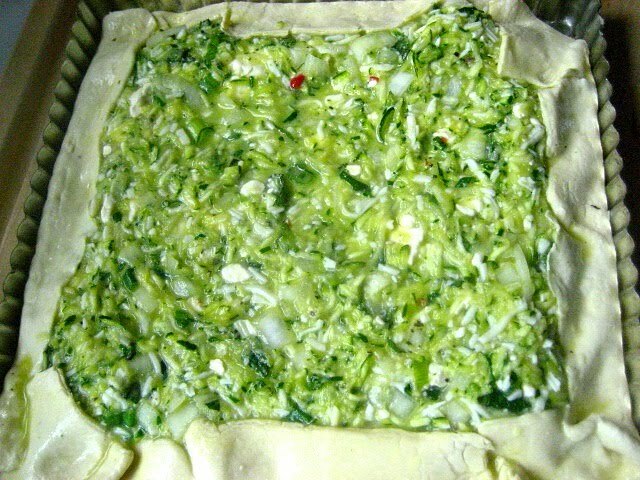 Instead of using phyllo dough, I have adapted this recipe using what else? Frozen puff pastry sheets. I know, it's not the traditional Greek way, but it tasted wonderful. 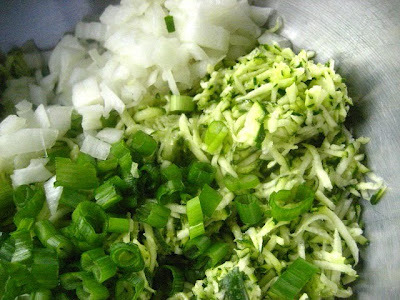 Start by grating your zucchini and squeezing the moisture out by wrapping the grated zucchini in a dish towel. Roll out the puff pastry to fit in a square or rectangle tart pan with removable bottom (you can use a round pan, no rules). Mix all the ingredients together in a bowl and season with salt & pepper. Pour filling into the prepared pan and fold over the edges of the pastry a bit. Brush the edges with some egg wash and bake on a baking sheet for 35 minutes at 400F. 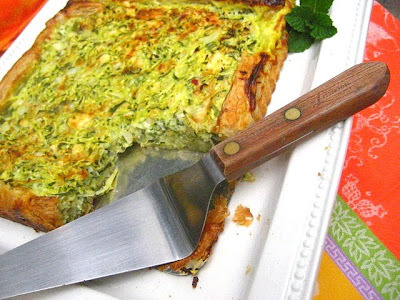 Let cool before removing the tart pan and serve warm or at room temperature. These can be cut up into little squares and served as appetizers or eaten as a main dish with salad. and in case you are wondering, yes, this is a Tuesday, and yes, this is a tart. I have a pile of zuchinni right now. 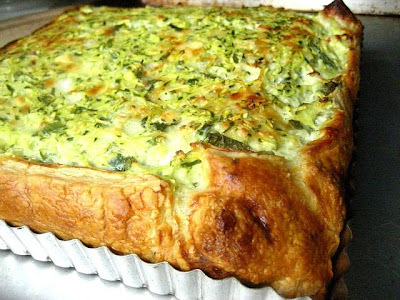 What a beautiful way to use all that summer zucchini. I'll bet the mint adds a really nice flavor. Why do I read this blog before I'm going to eat a less-than satisfying lunch? I so wish I could cut a wedge right off the picture of the pie! By the way, the Mango-Chicken skewers totally rocked my Memorial Day weekend BBQ! Thank you for a marvelous recipe! I love the flavors of spanakopita but I have no patience to muck with phyllo dough either. This is truly the perfect solution! Move over Tuesdays with Dorie, now it's Tuesdays with Stacey! I love ALL your tarts! Your zucchini tart look mighty delicious Stacey! Will make for Father's Day! Sounds yummy. Am always looking for ways to use mint and zucchini, which grows like weeds in my garden. Great looking tart, I think my husband might actually like this. I've never used puff pastry in a tart pan before - I've admired your use of it (still thinking about that ricotta and peas tart) and need to just try my hand at it. I love this idea! I also love spanikopita, but you do need to be in the mood to deal with filo. The dill and mint (neither of which I have used very often at all) make such an awesome flavor in this! Had to sub in some mushrooms as I was a little short on zucchini, but it was delicious. Thanks for the recipe!